Websites are the new storefront of your business, and it's vital to have an optimized site for the success of your business. With millions of customers worldwide, we've created the perfect process to develop a beautiful, engaging, mobile optimized website that converts visitors to customers. Being involved in the Nanaimo community for over 20 years, we build close relationships with our clients to create beautiful websites and online marketing campaigns that serves your vision and business best. We have created a process to effectively design websites that connects you with your audience. Web design in Nanaimo has been our bread and butter since 1997. Our team of experts designs and develops beautiful, functional and mobile responsive websites that are customized to generate traffic, leads and convert visitors to paying customers targeted specifically to your industry. Getting to the first page on Google in your city is the #1 goal for a small town. 99% of people will only search the first page of Google. We make sure your business is on the first page and in the top rankings, driving targeted traffic to your site everyday, increasing your profits, without effort. Social media lets you build trust, communicate, and show your brands personality to connect with people in your community. We understand the psychology of how social media works and we optimize your companies beliefs and personality to connect with your audience to drive growth and customer loyalty. Email marketing completes the digital marketing sales funnel. After growing your email list through social media, PPC and your website, Bravenet has innovative email marketing tools to integrate with your website and social media to grab your visitors email as soon as possible, building a large email list for you to target. 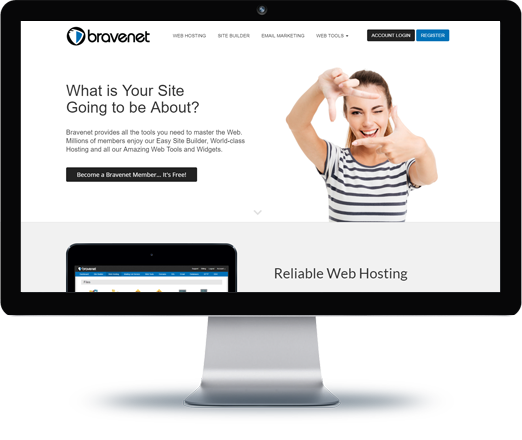 Having one of the largest hosting infrastructures in Canada, Bravenet's hosting services are built for speed, reliability and comes with the highest protection of SSL security to keep your website and data safe from hackers. Our unique content management system is built into every website developed by us to save you time, money and navigate efficiently and effectively. Find a domain that fits your brand perfectly, for a price you love. Searching, securing and setting up your domain through our advanced system makes it a breeze to walk through. Our Vancouver based email hosting servers keeps all of your storage, data and email all in one place, making your business work faster with more ease. Pay-Per-Click advertising puts your business on search engines, social media or any website that targets your audience online. We figure out exactly who your audience is, we understand their behaviour, find where they spend most of their time on the internet, and we display customized ads to bring you the most traffic at the lowest cost. Bravenet started with the intentions to give every local business a presence online. Dave Shworan (our founder) saw the value websites will bring to businesses and the opportunity of the Internet. Being an avid computer wiz, Dave quickly developed and grew a web services company, providing web services to millions of websites across the globe. Having achieved great success online, the Bravenet team is now committed to help every business in the Nanaimo community stand out and achieve bigger profits. We started Bravenet Marketing to give back to our community and help local businesses get the chance to show who their business is, in the right way.